Unless she gets a replacement lung. Maira was born in Karachi with a chronic, inherited desease called Cystic Fibrosis (CF), a rare pulmonary disease characterised by respiratory and gastrointestinal problems, with no known cure. Until she was a year-and-a-half old, Maira was in and out of the hospital for constant congestion and breathing problems. The disease being uncommon, doctors couldn’t quite place their fingers on it, and kept trying to treat her with decongestions and antibiotics. “She was pretty well-known in the paeds department as every nurse, doctor, attendant and other members of the hospital staff had tended to her at some time or another, due to our frequent visits there”, said Junaid Iqbal, Maira’s father. Junaid spoke of Maira’s condition in a matter-of-fact way, calm and detached. I must admit, I was anxious at the start of our call. As I dialled and listened to the phone ring, I was nervously thinking of encouraging things to say to father in grief. On the contrary, talking to him set my apprehensions aside, replacing them awe, disbelief and confusion. I was in awe of his composure; what courage it must take to live a struggle every single day. My disbelief was in imagining how the parents of an only child must handle the stress of their daughter fighting for her life. And it was confusing all the same; how does he keep it all together? How is he able to relay Maira’s suffering and answer my questions so objectively? Where is the grief, sorrow, hollowness, bitterness and why-me tone in his voice? As I started to pen down this personal story, I realised life is a totally different ball game for this family; where day-to-day decisions do not revolve around grades, viral flus, birthday parties, fight with a friend at shool and play date choices etc. Rather it is about one thing and one thing alone – how to stretch their daughter’s life a little longer … a day, a week, a month. Their entire focus is on timely treatment and the provision of a normal life that most 9-year-olds lead. And they cannot afford to falter or waste precious time. “When she turned 2 years old, the situation somewhat stabilised”, Junaid continued. Maira’s symptoms of cough and cold were not as acute as they had been earlier. Her parents learnt to manage her condition at home, unaware of the gravity of her ailment. They continued with the regular medicines, nasal pump to clear her clogged nose, and steam at night to help her sleep – the usual battery. In August 2014, when Maira was 6 years old, things went downhill. She was admitted to the hospital and X-rays showed that one lung had completely collapsed. All these years of mis-diagnosis led to the progressive weakening of this lung’s passages due to the excessive, thick mucus lining. Cystic Fibrosis (CF) is frequently missed in the Pakistani population due to the lack of appropriate diagnostic tools. The doctors advised the parents that they should seek help abroad as hospitals in Pakistan would not have the necessary care and capability. The other lung, showing signs of distress too, became the utmost priority. Maira’s parents researched desperately, trying to understand what CF was. They looked for treatment options available outside of Pakistan but everything seemed out of their reach, monetarily. UK and Singapore were far too expensive. Most hospitals quoted an estimate of USD 500,000 for initial checkups alone. 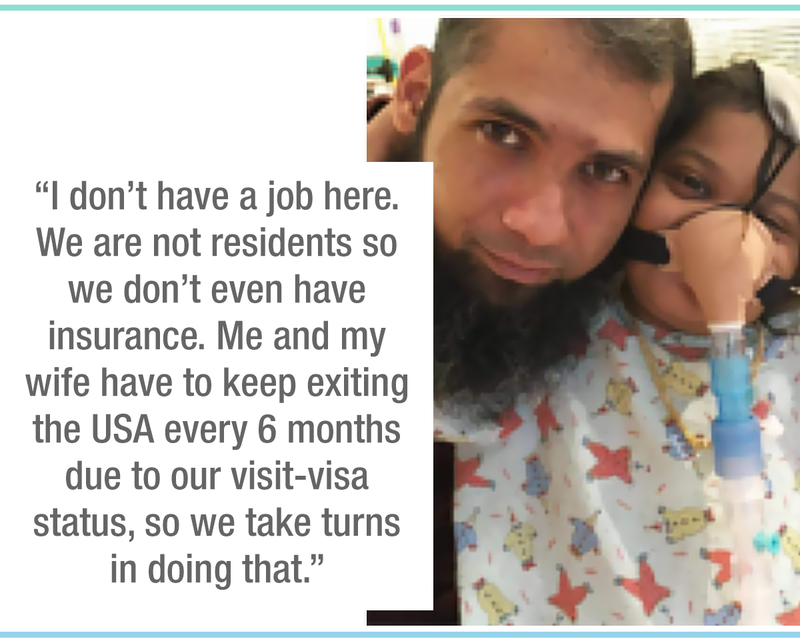 Texas Children’s Hospital gave them a minimum quotation of USD 106,000 and agreed to send them a letter of invite for treatment, based on which they could apply for visa. In the mean time, they reached out to friends and family for help. Junaid set up a Facebook page and reached out to people through social media. Their story got picked up by mass media, and soon, TV channels invited them on-set to discuss Maira’s case. The exposure helped build momentum for fundraising and, within 1 year, the family had raised USD 150,000. The long flight took its toll on Maira, who needed emergency care by the time they left the immigration desk. They were driven straight to Texas Children’s Hospital. She needed oxygen as her breathing was shallow, and had to be admitted right away. In the first ten days of hospitalisation, USD 50,000 had been spent on hospital bills and medications. “The care was outstanding, though”, admitted Junaid. “The doctors, nurses … everyone took such good care of her. She was recovering. Understanding that our funds were dwindling fast, the doctor advised us to take her home and continue to manage her there”. The family moved into a small apartment, and equipped it with oxygen cylinders and breathing apparatus to keep Maira stable at home. Not long after, however, on 30 November, Maira was in hospital again, this time for 6 months. She was a tangle of tubes and pipes – a gastro tube to feed her to gain enough wait for the operation; oxygen masks to assist with breathing on her lone lung. During this time, sometime in February 2016, the family thought thay had lost Maira. She was unconcious for 2 excruciatingly long days, as there was too much carbon dioxide in her system. Just as the parents were contemplating taking her back to Pakistan in an Air Ambulance, broken that they had risked all for nothing, she came around. The doctors were still not very hopeful, and said she had a maximum of 2 to 3 weeks. “But she came around”, Junaid insisted. “For us that was all that mattered. She came around. We had to give her another chance”. 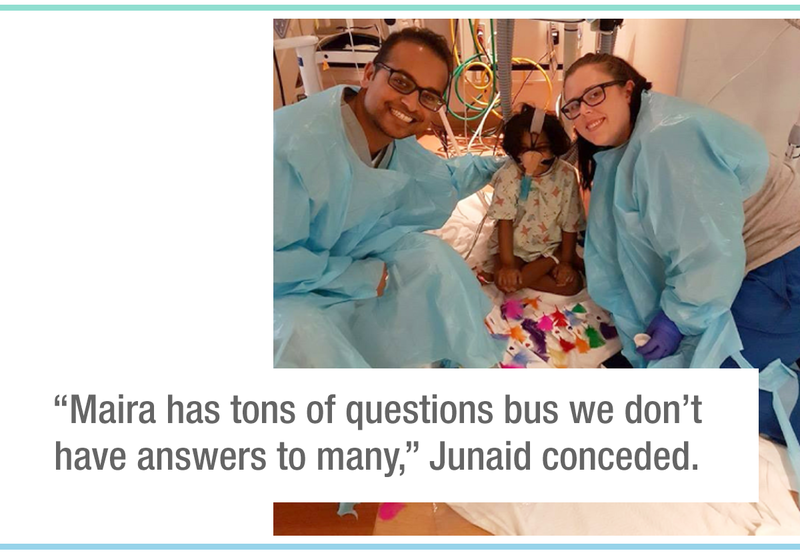 Junaid kept meeting and following up with the department heads of Transplant at Texas Children’s Hospital and with the Cystic Fibrosis Foundation (CFF). He urged them to put Maira on the list of hopeful candidates for lung transplant. He actively reached out to various media modes, non-government organizations (NGOs), Muslim and Pakistani Associations in Texas as well as other states in the US. As an international patient without health insurance, they needed to raise a whooping USD 1.8million to be paid upfront (which the hospital later revised to USD 919k in October, and further brought this quotation down to USD 650k just recently). The CFF hooked Junaid up with the National Foundation for Transplant (NFT), an organization that is helping spread the word to give the fundraiser needed exposure. Their story got featured in ABC 13, a local TV station in Texas, and NFT helped set up a separate campaign page for Maira on their website to channel fund collection. In the meanwhile, Junaid had also appealed to Children Special HealthCare Needs (CSHCN), a program of the State of Texas. CSHCN now helps them financially by providing therapy and hospitalisation cover, but major operations are not covered under this plan. Hence, Maira needs generous donors to raise the hefty amount of USD 650k for the actual transplant surgery. The Pakistani community in Houston has been more than helpful, doing every bit they can through bake sales, community gatherings etc. so donations, big and small, keep coming. But Maira needs much more. The family has come this far. They cannot go back. “Maira has tons of questions, but we don’t have answers to many”, conceded Junaid. Indeed there remain many questions unanswered. Will they be able to raise this seemingly unattainable sum of money? Will there be a donor lung avaiable in time for her? Will the lung, even if arranged and paid for, once transplanted be accepted by her body? If for some unforseen reason her immune system rejects the replacement organ, what will post-rejection treatment be like? On the other hand, if, God-willing, it is accepted by her body, the family still needs to have enough resources to pay their way through lifelong medication and treatment. How will this be sustained? As Maira needs to be under constant care of the hospital pre- and post- transplant, it is imminent that they settle in Houston permanently. Junaid left a fantastic IT job back home and is looking for one in Houston now. Will Junaid be able to find work and help localise the family there for sustainence? Answers to these questions unveil themselves with time .. but I do have one more for you to mull over: What if Maira was your daughter, sister or niece? Please help raise funds for Maira. Aghna Javed is a proud product of a simple gadget-free bachpan, mum's food, places she travelled to, the three boys in her life (yes, counting her hubby in too), books she has read, and everything else that life throws at her. Previously having worked at P&G, she is now a budding entrepreneur bringing interactive marketing campaigns to life in Singapore. Amongst her many aspirations in life, Aghna indulges in her childhood hobby of writing through FUCHSIA, volunteers with Singapore Red Cross, and simultaneously works on improving her Mandarin-speaking skills. Read more about Aghna in contributing writers.